Stylistically, the House is based on Italian Renaissance prototypes. 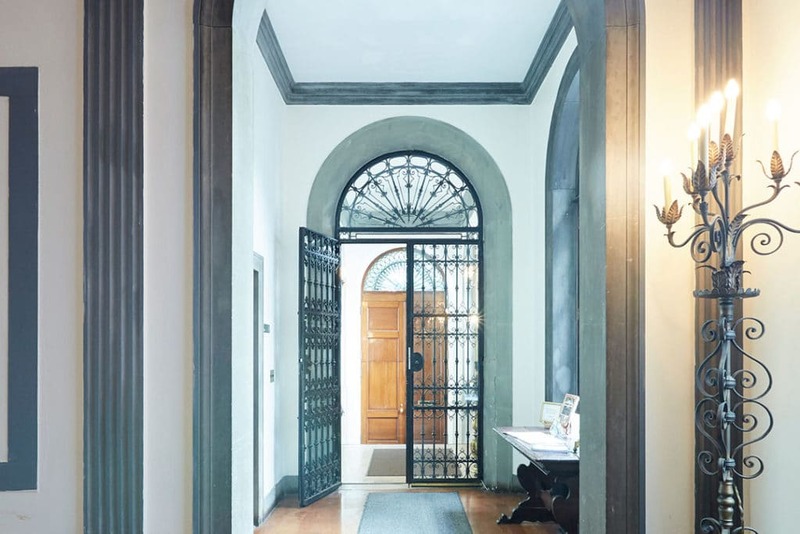 It shares many characteristics with Italian palazzi, such as the “L-shaped” floor plan, the courtyard, the window enframements, and the heavy stone cornice that crowns the building. 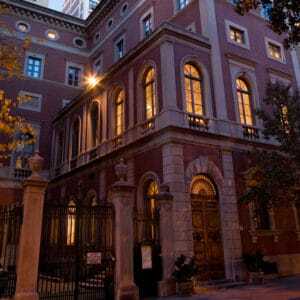 The House was designated a New York City Landmark in 1974, and is considered by many architectural historians to be one of the most distinguished examples of early 20th century residential architecture in New York City. 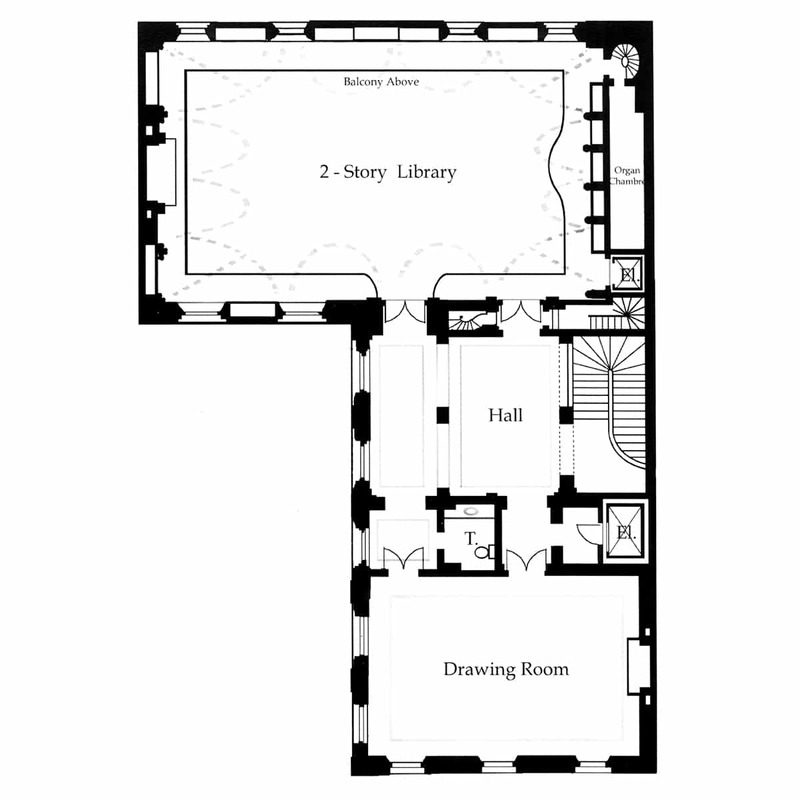 Click on floorplan areas to see photos of the room. The furniture of this room is predominantly Italian Baroque. On the east wall is a pair of Flemish landscape paintings, which date from the 17th century. 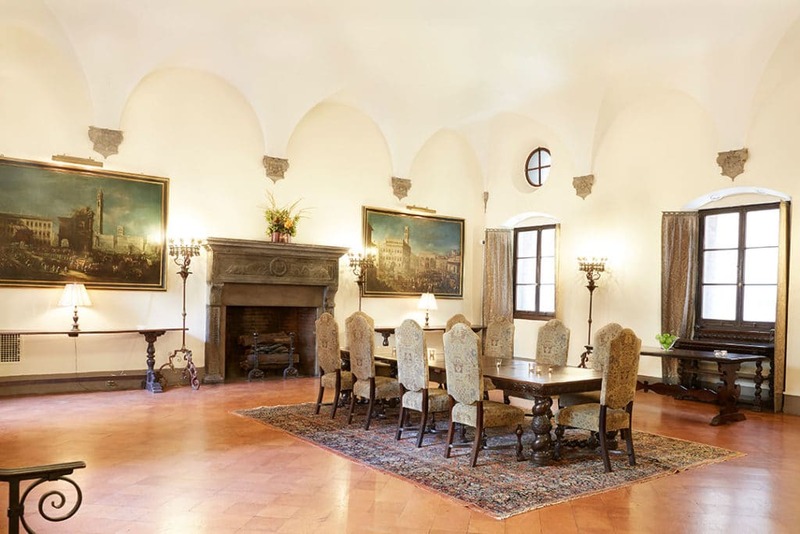 The paintings hanging on the west wall are Venetian, dating from the 18th century, and depict religious processions in Florentine or Venetian squares. 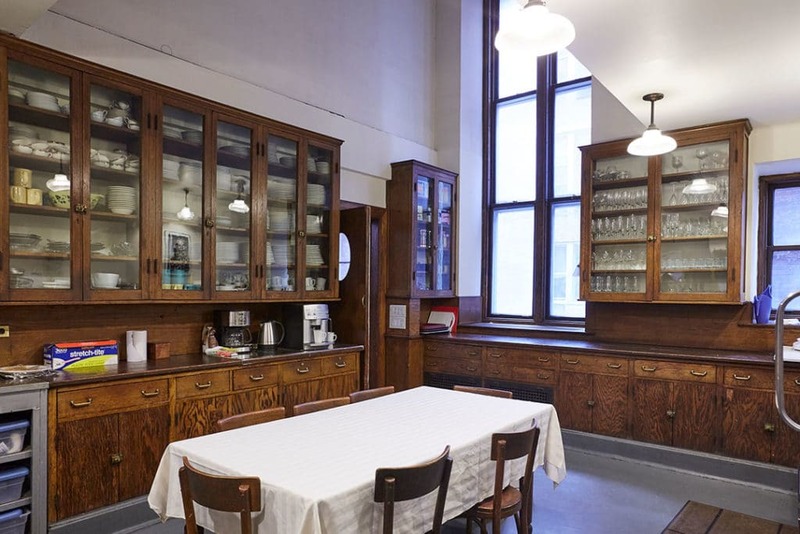 This room was originally used by Edith Fabbri to receive social calls. A stunning portrait by Benjamin C. Porter of Edith Fabbri as a young woman hangs next to the entry. The furnishings in the room include a jewelry cabinet of ebony inlaid with ivory (between the windows), a Flemish Verdure tapestry (on the east wall), a 14th century icon of Catherine of Sienna, a fine portrait of a man of the period, and Italian Baroque and Renaissance furnishings. In the hall adjacent to the room is an Italian Renaissance marquetry cabinet. The design for this hall is based on Filippo Brunelleschi’s design for the old sacristy in the Church of San Lorenzo in Florence. 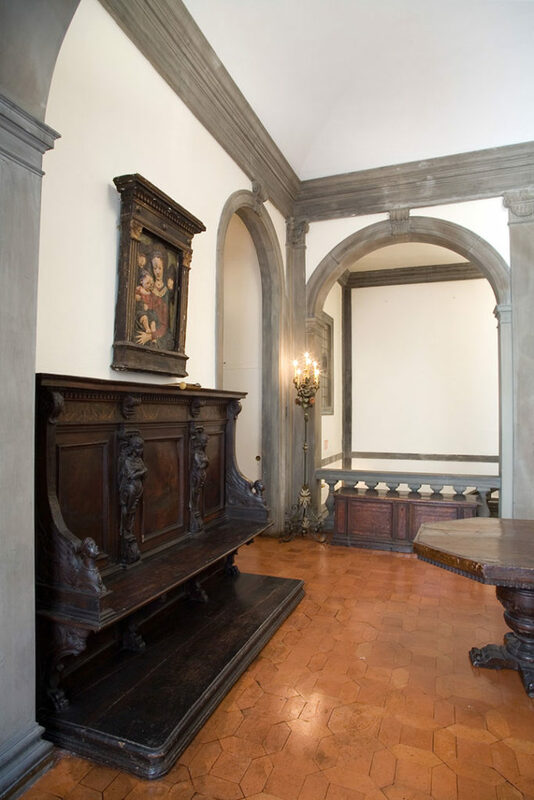 The hall is graced by other examples of Italian Renaissance and Baroque furniture. Like the first-floor hall, the architecture of this room was inspired by the work of the Italian Renaissance architect Filippo Brunelleschi. 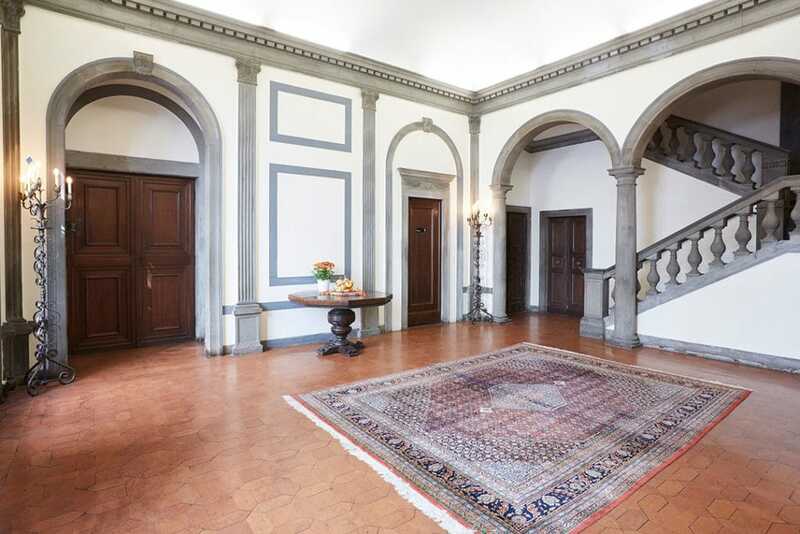 On the stairway are four late Renaissance candlesticks (now electrified). The hall itself contains exceptional Renaissance period furniture, particularly the carved walnut and inlaid choirstall on the north wall. On the south wall is a life-size portrait by Sister Mary Veronica of the Rt. Rev. William Thomas Manning, Bishop of New York from 1921 to 1946. 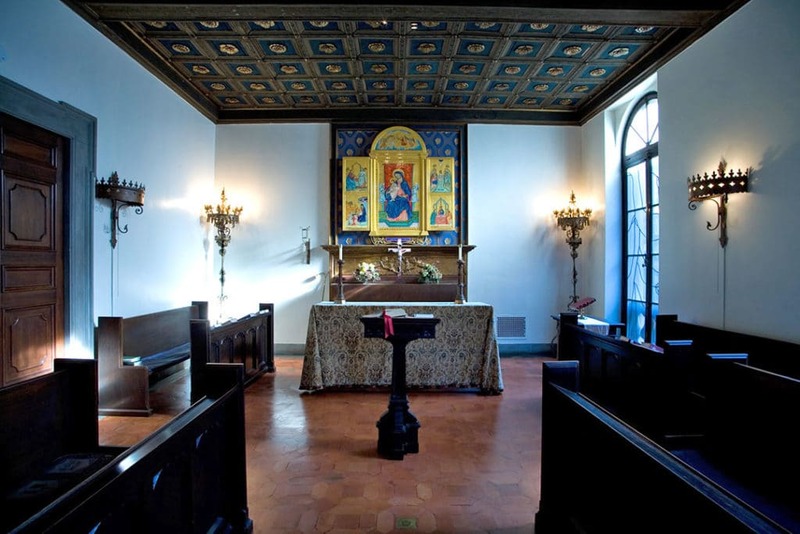 The Chapel originally served as Edith Fabbri’ s formal drawing room. The carved mantel, which now serves as the reredos for the altar, and the coffered ceiling were both part of the Fabbri’ s collection of architectural fragments and were incorporated into the room by her brother-inlaw, Egisto. 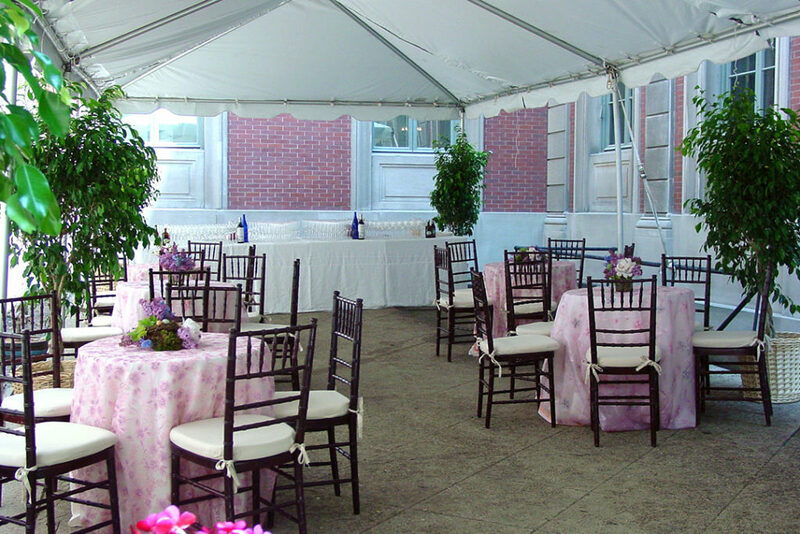 The leaded-glass windows, installed in 1985, were designed and executed by Bonnie Farber of Glastonbury, Connecticut. They were given in memory of Mrs. Russell Twisse, a member of St. James’ Church and The New York Altar Guild. The triptych over the altar was painted by the Rev. John Walsted and donated to the House in 2001. In 1992, the Rt. Rev. John M. Allin, 23rd Presiding Bishop of the Episcopal Church, presided at the rededication of the chapel as the Bishop Horace W.B. Donegan Chapel, in memory of the man who served as president of the House’s board of trustees for thirty-nine years. 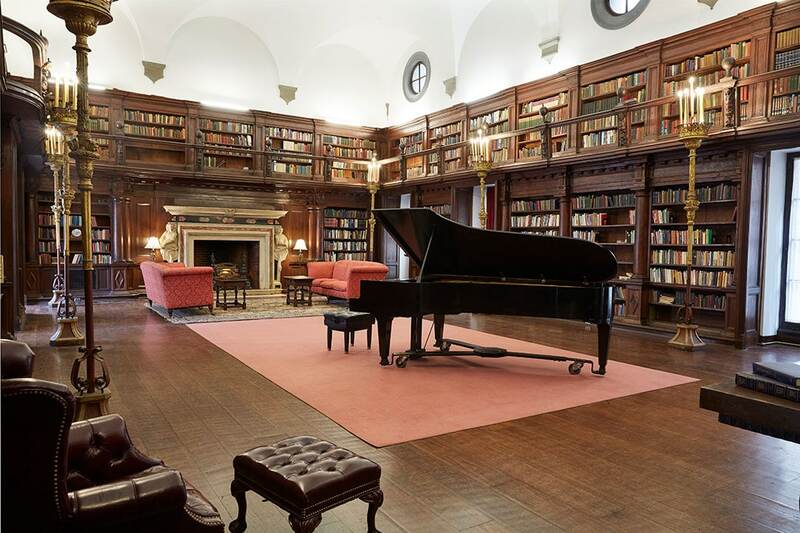 The library is one of the great treasures of House of the Redeemer. Constructed for a 16th-century Ducal Palace on the outskirts of Urbino, Italy, the woodwork was purchased by Edith Fabbri at the outbreak of World War I and incorporated into the design of the House. It was shipped via two different vessels so that at least half of the room would survive if one ship was torpedoed. The woodwork was installed by a Florentine carpenter by the name of “Tonino,” under the direction of Egisto Fabbri, who designed the organ grille and the main entrance to correspond to the original design. The magnificent carved mantel was also taken from the Ducal library outside Urbino. 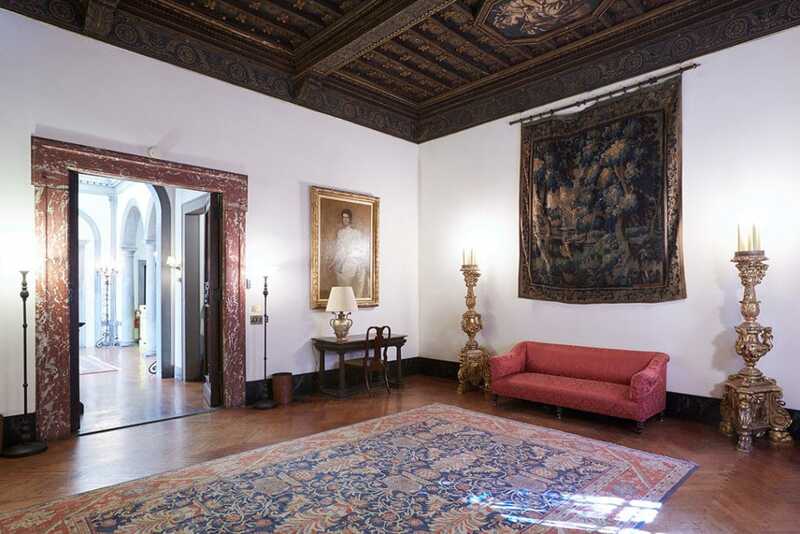 The ceiling medallion depicts the arms of Francesco Maria II Della Rovere, the last Duke of Urbino. The two-manual, 41-stop Aeolian player organ in the gallery was used to accompany the silent movies that Edith Fabbri would show her guests after dinner parties. (A projection booth is located directly above the organ.) 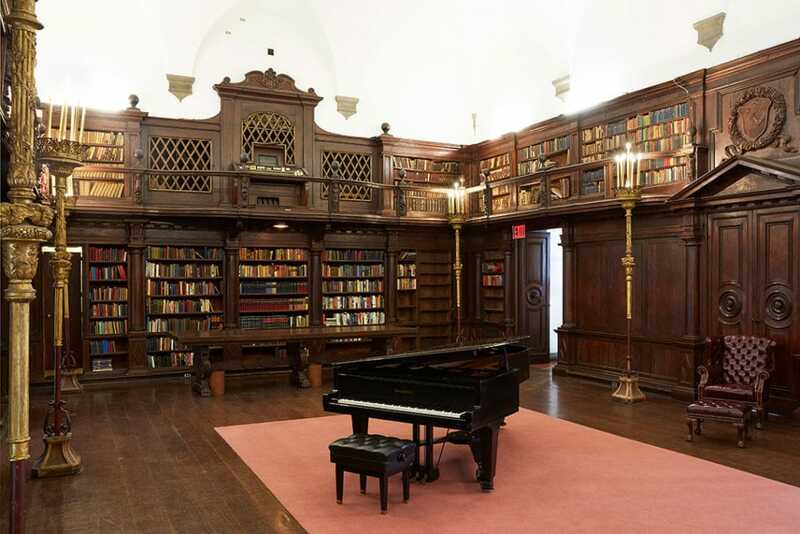 The library also contains a “secret room” located behind a bookcase at gallery level. The bedrooms for family and guests were arranged in the European style as self-contained private apartments composed of a sitting room, bedroom and dressing room/bathroom. The family occupied the third floor apartments, while a guest apartment was located on the mezzanine between the second and third floors. Egisto Fabbri occupied a bedroom suite on the fourth floor that included a sky lit painting and photography studio. The third floor apartments now serve as space for the “priest in residence” and as guest rooms. Great houses of the early 20th century required a large number of servants to keep the establishment running. 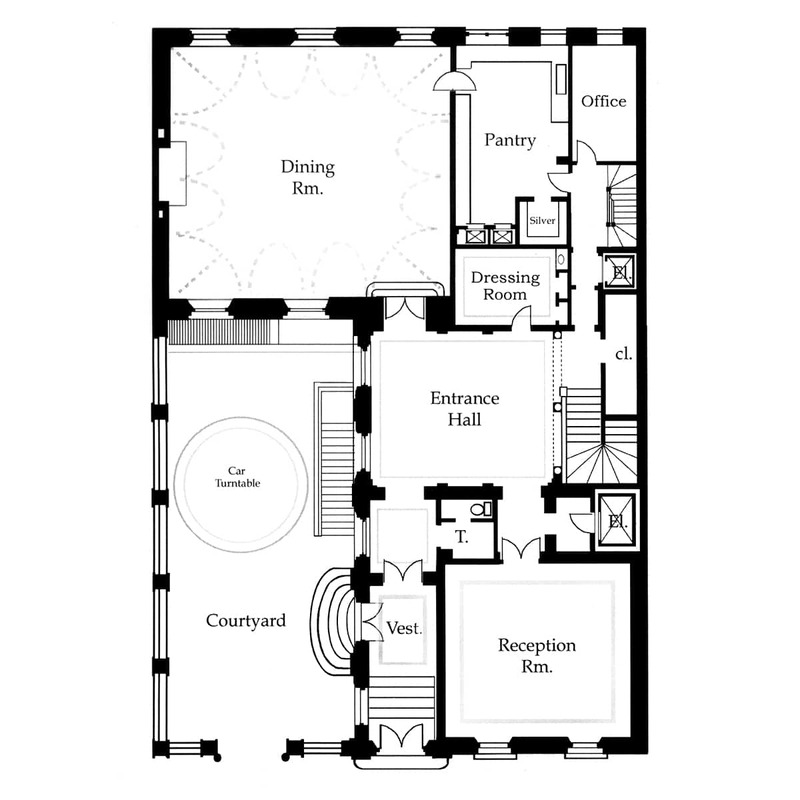 In the 1920 census, eleven servants were reported as living in 7 East 95th Street. However, social propriety of the period required that servants remain out of sight, except when expressly wanted. For this reason, the servants’ quarters are almost completely undetectable, except by those who know the House well. The door from the service elevator into the library is invisible when closed. Inconspicuous doorways on either side of the library entrance lead to the winding stairways that provided access for the servants from floor to floor. The servants’ rooms on the fourth floor of the House now serve as guest rooms for retreatants. Please contact the House office for rates information; reduced rates are available for churches and non-profit organizations.